Who doesn’t like the crispy bits on the top of a mac ‘n’ cheese? They are my favourite bits. The crispy bits of anything frankly, and I must be honest, I have a real problem with crisps. If there are any in the house, I just can’t help myself. From the toxic orange cheesy corn snack to swish expensive Spanish crisps fried in extra virgin olive oil, I am helpless when in range. So, I rarely have them inside the front door. Some days however, when I am controlling my access and there are none in the house, I still want some or something / anything to snack on. This has been a life long problem, and I first tried to make crisps when I was a child from the left behind small potatoes in the field in front of my house. I wanted to replicate exactly what I had had from the shops so, after a few efforts I was disappointed, and stopped. As an adult I have had a lot more success. The small child inside me rejoices, and the adult who would really like to fit into that lovely red vintage dress of yore ponders while tucking in. 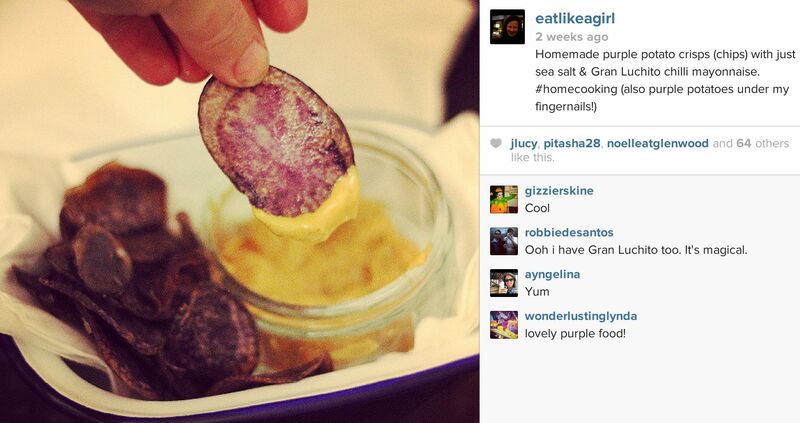 Last week I made purple potato crisps which were a massive hit (the photo here is from my instagram feed – a lot more gets posted there than ever makes it here so make sure you follow on instagram, facebook or twitter). I haven’t just made snacks with the humble spud. I have experimented a lot. I love leftovers, and I love trying different things with them. It may not be possible to polish a turd (nor should you eat one), but leftovers can be so much more glamorous than the original dish, once the original dish was decent to begin with. Taking risks with leftovers is no big deal, they are there to play with anyway (and also, finally, to eat), so years ago in university I looked at a plate of leftover spaghetti and fried it. And that was it. I soon found out that this is far from an original idea, the Italians do it (pasta fritti), the Maltese do it (called froga which is like a leftover spaghetti frittata). 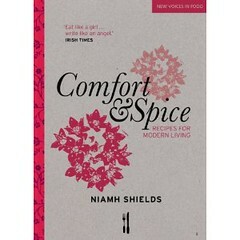 I have a recipe for an omelette with leftover papardelle with ragu in my first book, Comfort & Spice, too. Leftover long pasta lends itself brilliantly to an omelette, you should try that. Added to this, instant noodles are simply cooked noodles deep fried to extrude the water and dry them in order to preserve them, this works really well for pasta too, and you can keep your fried pasta snacks in an air tight container for a while. I say this is a great leftover dish, but the reality is that I often cook the pasta to make this at home. 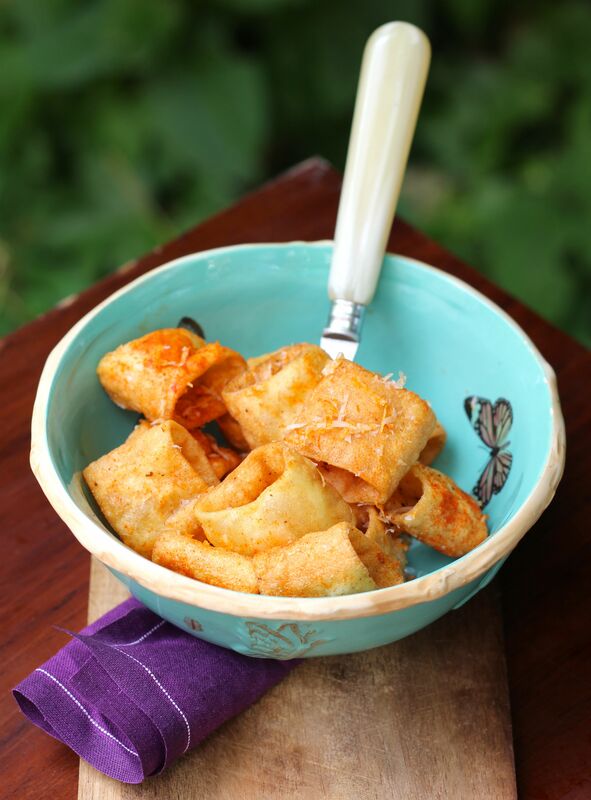 Fried pasta is a fabulous crispy snack, with each shape giving a different result. Here I have used large round pasta shape which lends itself well to frying. Don’t use cheap pasta, just because you are frying it. Good ingredients make good eating, so use the best you can get. You can use lots of different toppings – good melting cheese grated fine and used sparingly works well and dried spices and chilli too. I had some lovely manchego and some smoky Spanish paprika so I gave this rendition a nice Spanish twist. I don’t have a deep fat fryer, so I just fill a large deep frying pan with oil to about 2 inches. You could do this in a sauce pan too but fry in batches, making sure that the pasta is in a single layer with room to mooch about or it will all stick together in a gloopy mess. A thermometer is useful and helps get best results, but it is not essential. Heat enough oil for your pasta to be covered completely (aim for twice the height) to 180 deg C. If you don’t have a thermometer, test it by throwing in a little piece of the pasta, if it starts to sizzle furiously you are there. Add more pasta, ensuring there is one layer and that the pasta has plenty of room. (This will reduce the temperature a bit so keep it on a high heat but watch it – oil at this temperature needs to be carefully monitored when in a pan with no temperature control, and take care not to burn yourself). Move the pasta around regularly ensuring that all parts of the pasta get attention from the oil and that the individual pieces don’t stick together. A slotted spoon will work well for this. After about 5 or 6 minutes, if using a large shape, the pasta should be very crisp and golden. This will depend on the size of your pasta shape, small pieces make take only a couple of minutes. Remove carefully from the oil as they finish with a slotted spoon or tongs and drain on a plate lined with kitchen paper. If you have a metal sieve you could toss them in this too to rid them of excess oil, before placing on the paper. (The sieve is redundant if you have a proper fryer obviously!). While still warm, finely grate some manchego on the pasta. Toss it quickly, so that all of the pasta has some manchego melted on to it. Season with sea salt to taste and add a sprinkle of paprika. These are great hot, but also cold. Save them in an airtight container for a few days if you don’t eat them all there and then. But you probably will. Looks heavenly! And rather sinful but in a good way. Wish I’d had the energy to try these yesterday when I was a hungover mess on the sofa, they would have been perfect!!! Unfortunately I often have leftover pasta. My kids go for the sauce. Thanks your article now I have my tool to fight back.